The CMX7262 Professional Radio Vocoder IC is a device supporting Tri-Wave Excited Linear Prediction (TWELP) vocoder, utilising CML’s FirmASIC technology..
TWELP is the latest state-of-the-art vocoder technology providing high- quality natural sounding voice and good reproduction of non-voiced signals such as: police, fire and ambulance sirens. Input and output signals are passed through the C-BUS interface or the on-chip analogue-to-digital and digital-to-analogue converters (ADC/DAC). The Function Image can be loaded automatically from a host µC over the C-BUS or from an external memory device. The Function Image upgrade releases can enhance the devices functions and features. The CMX7262 operates from a 3.0V to 3.6V supply and includes power saving modes. It is available in a 64-VQFN (Q1) and 64-LQFP (L9) packages. Q. Should pull-up or pull-down resistors be connected to CMX7262 device GPIO pins (GPIOA, GPIOB, GPIOC, and GPIOD)? When the CMX7262 is RESET (by asserting its RESETN pin, issuing a C-BUS General RESET or by triggering an internal power on reset) all its GPIO pins are immediately placed in CMOS digital input mode. Any GPIO pins not being pulled either up or down by an external load will be floating. Once a Function Image™ is loaded into the device then all its GPIO pins are placed in CMOS digital input with bus hold. Configuring and optimising a set up for the evaluation of speech using the CMX7262 TWELP Vocoder. 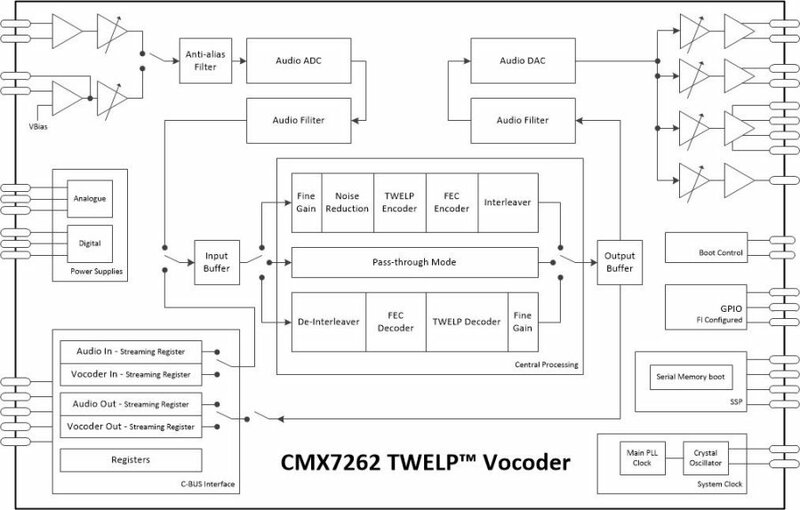 A simple guide to help users get started evaluating the CMX7262 TWELP Vocoder using the PE0602-7261. A PE0003 or a processor development kit with an SPI interface is required for control. Encode2dsk.pes encodes audio into TWELP frames and store them on the PC disk. The length of the recording is set in frames. The FEC mode can be toggled and frame size can be set to all possible values. The script opens a text file to which it writes the settings so that the decode script settings are correctly set. Decode_from_disk.pes takes the pre-recorded TWELP frames from the PC disk and decodes them to audio. The length of the recording is determined by the number of recorded frames saved to disk by the encode script. Options in both scripts allow for different input sources and different outputs.